Social media platforms are used by professional businesses, journalists, facilitators, consultants and a multitude of other professionals who have jumped aboard this digital medium to get their messages out. More and more cartoons of all types ranging from single panel gag cartoons to comic strips and even customized humorous illustrations are quickly appearing. Using a cleverly placed image that will help in getting attention only makes sense. Earlier my cartoons and custom illustrations for social media were profiled by Bonny The Web Chick. You can add images to your tweets when using Twitter to promote an upcoming even and a cartoon that matches your hash tag perhaps, would be ideal. 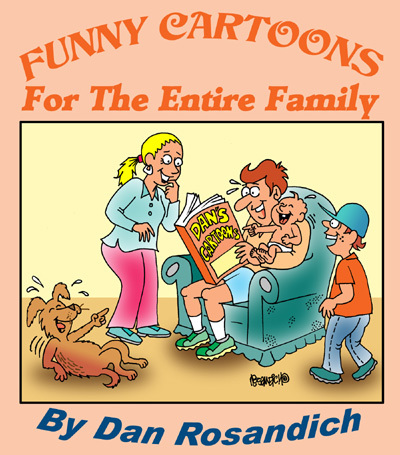 By going to my various catalogs, you can pick out a specific type of cartoon based on your needs. That image could be sent to you in high resolution JPEG format and sized if you request it. 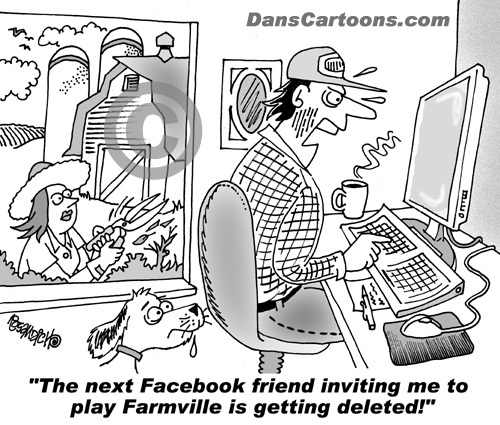 The next facebook friend inviting me to play farmville is getting deleted! Other platforms like StumbleUpon would also be the perfect platform to add an image or have a specific type of custom illustrated cartoon added to represent your company. You can get a custom cartoon created specifically for this purpose! Think how unique your tweet or page will look when someone finds you in the search engines based on your hashtags! If you use Facebook, a cartoon can be embedded on your page that emphasizes your company’s ideals and mission statement. Existing cartoons I offer, can be re-drawn, colorized or re-captioned to fit your slant or the topic in question. Don’t limit your concept of using cartoons to promote yourself to just social media, think about embedding an image in your email signature – something that speaks for you and your company or pertains to your mission statement. Think of your best or favorite social media tool and which cartoon would work best in the feed or as an attached image and I can assist. If you have any questions, just ask and I can offer creative insights into how a cartoon could work in a certain paragraph or within a widget on your page. Options vary greatly but one thing’s for certain and that’s cartoons attract attention.